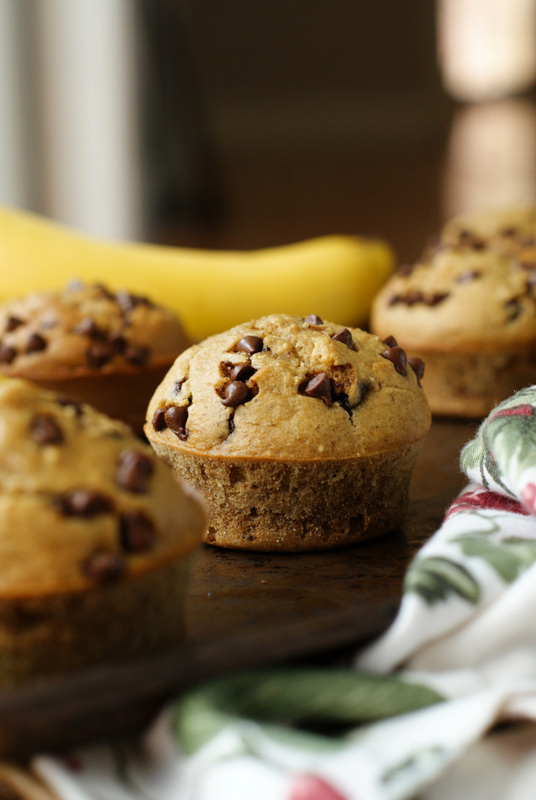 Flourless Banana Chocolate Chip Muffins are made with a batter that has no flour, no butter, and no oil and is mixed together in your blender instead of a mixer. They are moist, delicious, and could pass for breakfast or dessert! You know what I love? I love when a muffin has a nice, round, poofy top. Big fan of a robust muffin top over here. It's so disappointing when you try to bake up a nice treat in your muffin tin and it ends up all flat and sad. Muffins with no muffin top shouldn't even call themselves muffins. I was so so happy when I flipped on the oven light while these particular muffins were baking because they popped right up with gorgeous chocolate studded domes! Just look at that picture up there. That top is poppin'. Now, while a bulbous muffin top is key to optimal muffin goodness, there is most definitely more to a muffin than it's top. A muffin should taste good, too! Duh! Some muffins are super sweet and each bite is like sugar-laden heaven. I adore a beautiful, buttery, brown sugar crumble on a warmed up muffin, don't you? My mouth waters just thinking about it. Sometimes, though, I like to try to lighten up sweet baked goods with better for you ingredients. Honey makes a great substitute for refined sugar, oats can be subbed for bleached flour, and Greek yogurt keeps things perfectly moist. This muffin batter is actually blended in the blender as opposed to using a stand mixer. It's a brilliant way to blend up the oats with the rest of the ingredients! My blender is kind of ancient, so it needed a little help to get going (I had to stop the blender and stir the mix a few times) but, all in all, it was a super way to get the batter made. If you really want to go super healthy with these muffins, you can lighten up on, or even omit the chocolate chips. I do suggest keeping some kind of sweet add-in in the mix because the batter isn't terribly sweet on its own. I think raisins and a dash of cinnamon would be great! The last think I should mention about these muffins is that I baked them in my silicone muffin pan, which I adore. I have both the full size and the 24-cup mini muffin pan. They make getting the muffins out of the pan a breeze and the pan is super easy to clean. I seriously love them. I hope you love these better for you muffins as much as we did! They didn't last long around here, that's for sure. If you try them, I'd love to know how they turned out for you! Preheat oven to 375 degrees. In your blender, pulse together all ingredients except for the chocolate chips. Pause to stir if ingredients do not blend well at first. Blend until well combined. Stir in the chocolate chips. Pour batter into a 12-cup muffin pan lined with paper cups. (If using a silicone pan, you can skip the paper cups.) Sprinkle with additional chocolate chips, if desired. Bake for 15 minutes until the tops are puffed and golden and a toothpick inserted in the center comes out clean. You can sub all or some of the chocolate chips with nuts, dried fruit, or whatever other mix-ins you like in your muffins! I liked using the mini chips, but normal sized chocolate chips would work just as well. The way the recipe is written, there is chocolate in every bite. I think you could even reduce the amount of chips and they'd still be delish! Do you think Kefir would work in place of the greek yoghurt? I haven't tried it, but I did some digging online and I think you can! Strain Kefir through a cheesecloth or coffee filter and use at a 1-to-1 ratio. Let me know how it works if you try it! 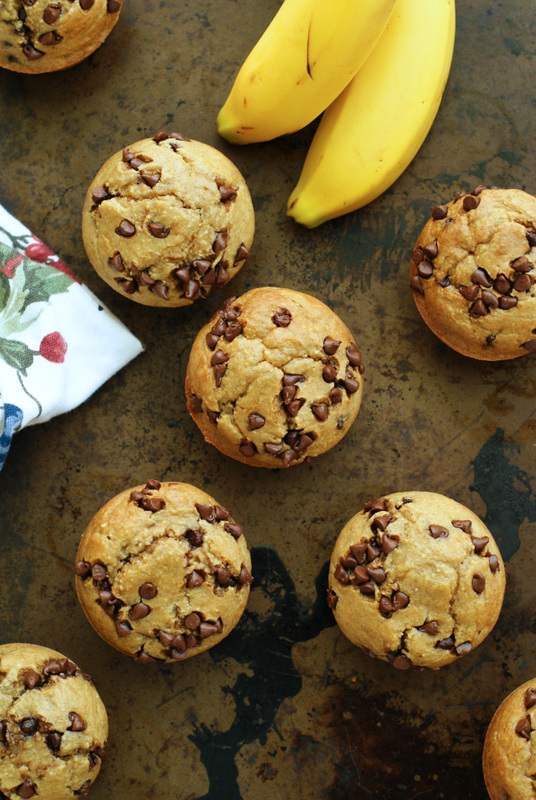 I've been loving banana muffins lately and how delicious and healthy they are. These look so good ... especially all those chocolate chips! Yum! Thank you so much, Kristen! 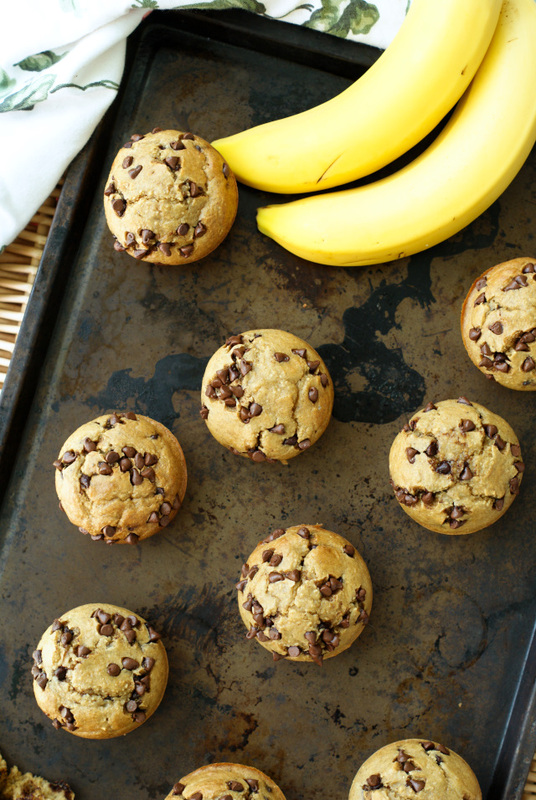 We love banana muffins, too. These were definitely a treat! If you switched the honey with sugar how much would u use? I haven't tried it, but if I did I would use 1/4 cup sugar. If you try it, I'd love to know how it turns out! Can i substiute greek yoghurt with sour cream? I haven't tried it, but I don't see why not.